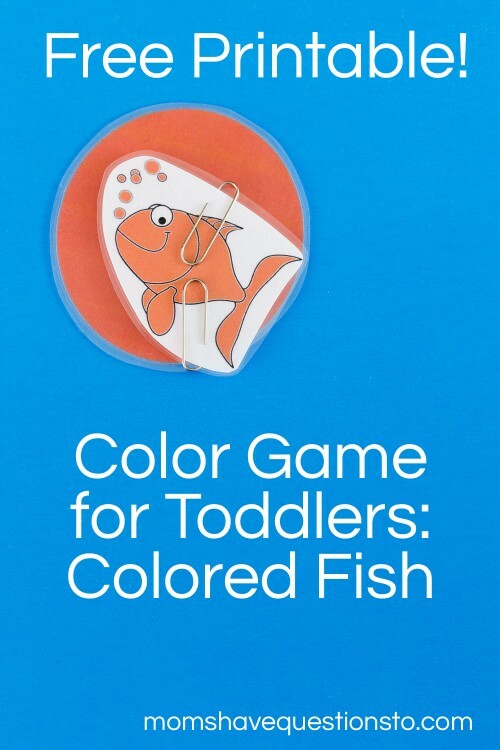 Color Games for Toddlers Part 5 — Colored Fishies! Colored Fishies! Okay, I know that this idea has been around forever, but if it ain’t broke, don’t fix it, right? ;) This idea isn’t new, but I did add a fun little poem to help with color practice and to turn it into more of a game. 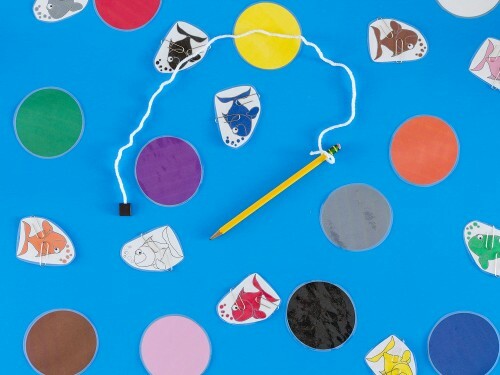 To make the fishies and their colored sand mounds: print off these color fishies. If you don’t have a color printer, you can just cut fish shapes and circles out of colored construction paper or cardstock. If you want the fishies and sand mounds to be a bit more durable, cover them with contact paper or laminate them. Next, put 1-2 paperclips on each fish or staple each fish 2-3 times. To make the fishing pole, start with a plain pencil. Tie some yarn to the eraser end of the pencil. 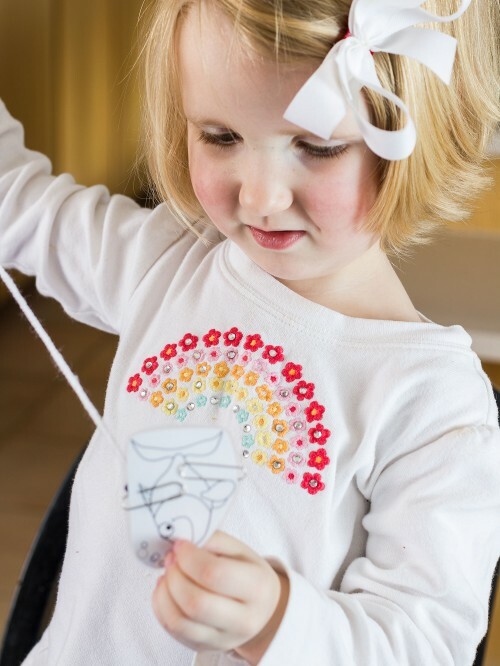 Make the “fishing line” as long as you want it, then cut the yarn. Get two small magnetic squares with a sticky back. Place the two magnetic squares on the very end of the yarn, with the sticky backs touching each other. Now that your materials are ready, it’s time to play the game. We start by putting all of the “sand” mounds on a blue poster board so it looks like they are in the ocean. Then, we put the fishies in the ocean in random place. The fishies should not be on their sand mounds yet. 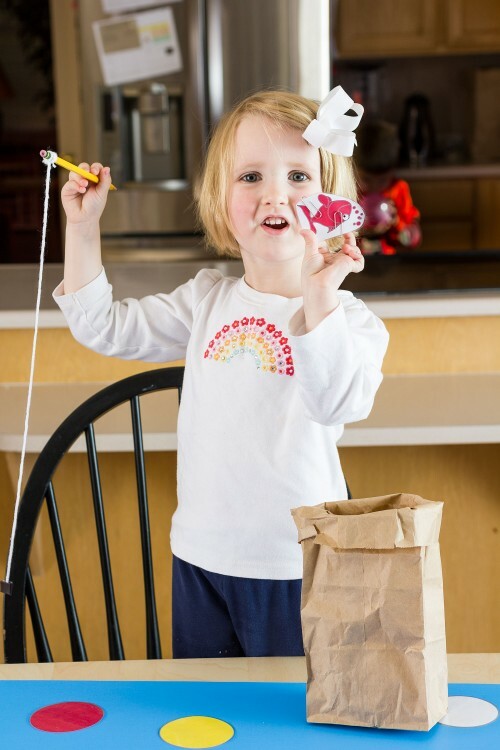 Next, have your child get ready with the paper bag next to him and with the fishing pole in his hand. 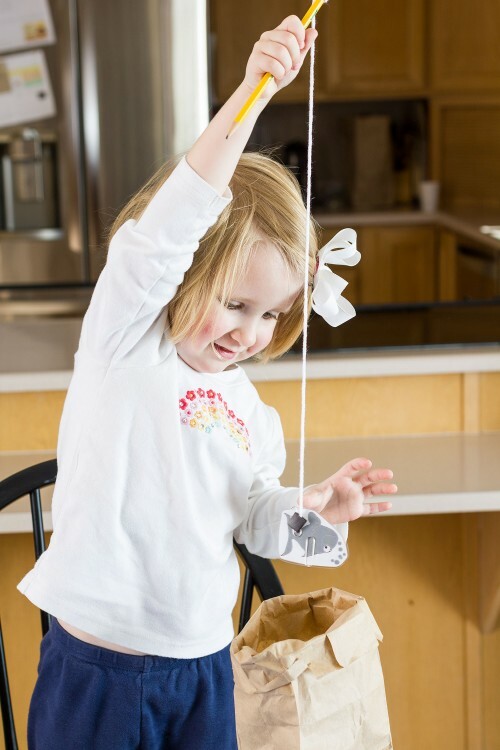 Tell your child that he is going to try to catch some fishies and if he catches any, he can put them in the “boat” (paper bag). He (or she) saw a hook and swam away. Will the hook catch the fish? Now have your child move the fishing pole around to try to catch the fish, while you try to swim the fish back to the “sand” mound. And into the boat he will go. He sits upon his sandy mound. Continue this game with all of the colored fishies until they are either in the paper bag or on the “sand” mound. If you want, count the number of fishies that your child caught. 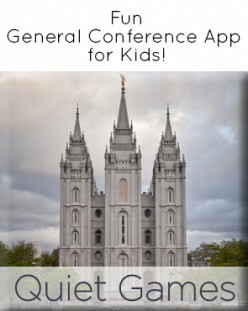 Next, switch places and have your child try to get the fishies back to their home before you catch them with the fishing pole. This game is wonderful because you name the color of the fish two times during the rhyme. It is also great because your child has to color match when he is trying to put the fish on its sandy mound. If the fish goes on the wrong sand mound, he is not safe. 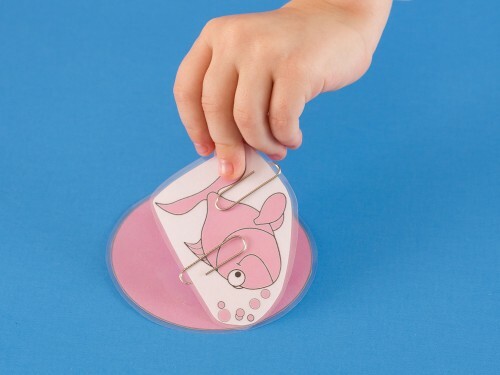 You could also use these fishies to play the traditional fishing game. To do this, put all of the fishies in the paper bag (or a box or a plastic tray, etc.). Have your child fish. When he catches a fish on the fishing pole, have him name the color of the fish. If he gets it right, he can put the fish to the side. If he gets it wrong, tell him the correct name and have him put it back in the paper bag. Continue until all the fishies are gone. 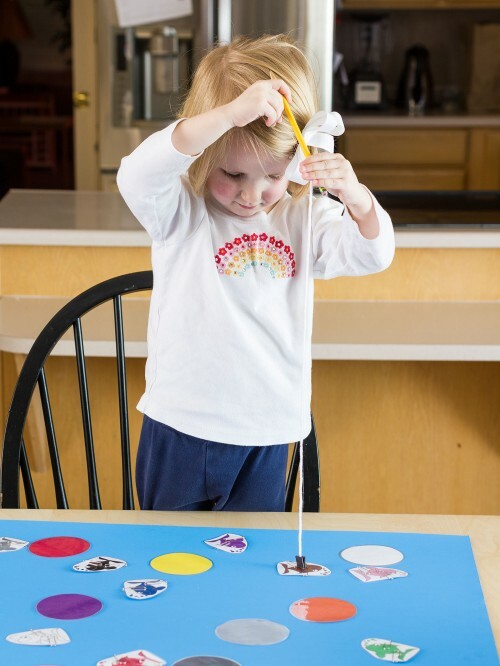 Be sure to check out all of my other color games for toddlers! This is just one in a series of twelve that I will be doing!